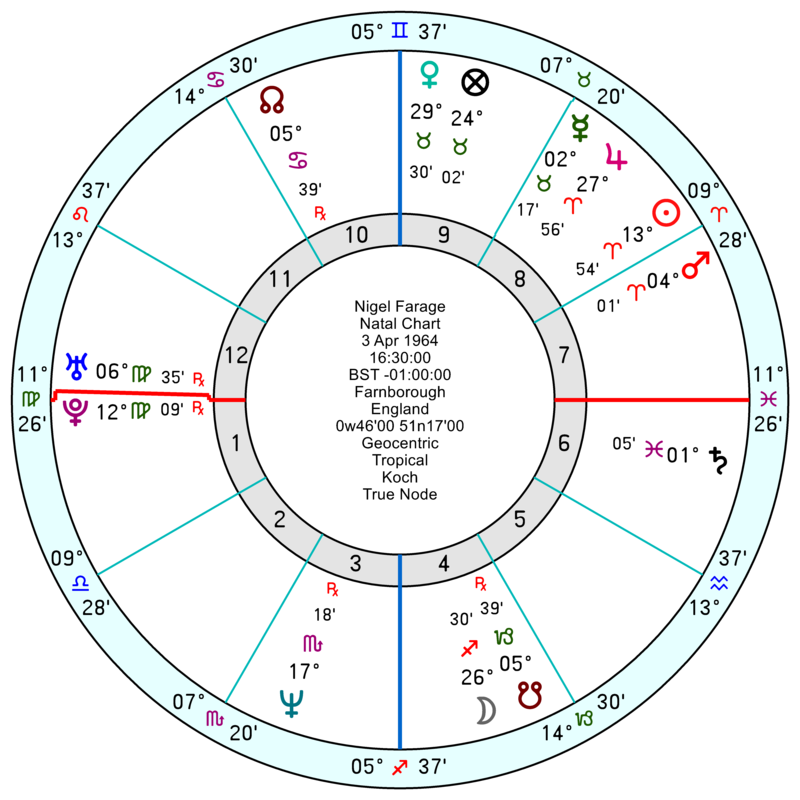 Jeremy Hunt has tr Uranus square his Jupiter for a lucky break and high enthusiasm in the first half of May; with more positive changes in July and August with tr Pluto trine his Sun/Jupiter. But he’s horror-struck by events this month, again mid August to mid September, and next February; and cornered and stuck mid November to mid December. 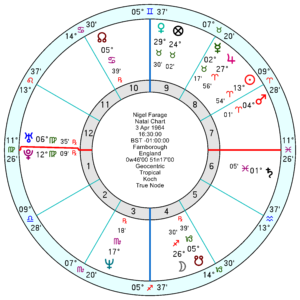 Michael Gove has tr Uranus trine his Virgo Sun from mid this month and then trine his Mercury in late May early June which could suggests a definite shift. But he’s also got very trapped Pluto transits to Mars midpoints all year and into 2020; plus a loss-making Neptune mid November to mid December. Boris while partially back on form till mid May also has a run of jittered, jangled, stuck, enraging and undermining influences till late year. Arlene Foster has one high spot in the first two weeks of May and it’s downhill all the way thereafter with a crisis around the July Solar Eclipse and a dead halt through the autumn. Sajid Javid is making hiccupping progress through the year with Uranus hits on midpoints but with nothing indicating success. Ditto Andrea Leadsom. And Bill Cash, a vociferous leaver, isn’t looking remotely chirpy either until mid 2020. Jacob Rees Mogg is in for a run of disasters from the middle of this month till early May; and again mid December to early February 2020; with more insecurity-creating and aggravating jolts and jangles in June and onwards. He’ll recover some of his enthusiasm from mid February 2020 onwards but only mildly so. His sister Annunziata, an Aries with a risk-taking and confident Water Grand Trine of Mars trine Jupiter trine Uranus is looking mighty deflated from early May to mid August and again in 2020; with acute frustrations and aggravations from Pluto on Mars midpoints through the autumn. are there any politicians who are having a good time at the moment which is reflected in the astrology ? For what its worth I ran the birth dates of both Nigel Farage and Yvette Cooper through Robert Hands Free Short Report Forecast on Astrodienst and Farages’s came back the generally more positive with regard to the selected key transits. Personally I am increasingly starting to think that both British and EU politicians of all stripes are like people bickering over the colour of the lifeboats on the Titanic just as it was about to smash into an iceberg. Love your comment. Just about sums up this “omnishambles”. Sad that so many in the UK are willing to surrender to Brussels and foolishly believe that the globalist billionaires’ puppets have their best intentions at heart. Read Marjorie’s posts about the EU and you’ll see that financial crisis is coming that will bring ridicule to remainers who are gleefully selling the country out and absorbing the false fear. Revolution is coming and Farage is the least of your worries. The interesting thing about Arlene Foster is that the DUP’s confidence and Supply agreement runs out in June (that is unless Theresa May extends this parliamentary session to try and avoid that) and I can’t see how the DUP will continue to support the government while the Withdrawal Agreement with the backstop intact is still in play. 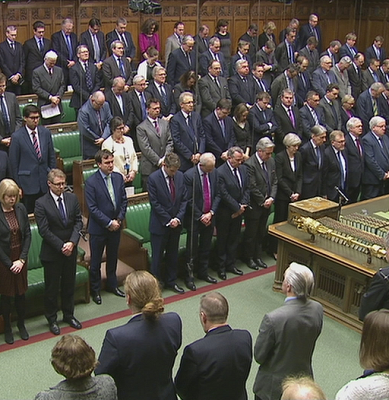 I can’t see how a general election is going to be avoided and my guess is we will get one around September which will bugger up par conference season. Thaaaank you, Marjorieee! So everyone is in a deep hole, it seems. Oh, the joy. No wonder that black-hole pic surfaced at this time. Hi Marjorie, interesting take on this unsavoury cast of characters. I want to compliment you on your oftentimes great phrasing and your array of adjectives and adverbs ! I’m quite curious what planets / aspects indicate “hiccuping progress”? The Brexit Party was formally launched on 12 April at a launch party in Coventry, West Midands which started at 11am. It would be interesting to know what the aspects were like for the launch. As mentioned above is this the true time of inception ? The Guardian stated the party applied for electoral registration on 11 January 2019 and the Electoral Commissions own documents show this was approved on 4th April 2019. In law the Electoral Registration process essentially creates the Party name as you can not use one not approved by them. a case of ever diminishing returns. A case study of personal and political irrelevance. His Russian financiers/handlers, whose main goal is to sow discord, are going to turn their attention elsewhere very soon after Brexit. You already see this happening elsewhere in Europe. Climate change denialism, or at least the claim small nations can’t do much to stop larger picture and should not introduce policies to fight it, seems to be the new refugee crisis in Western Europe, gay rights in more Conservative Eastern and Southern Europe. Farage might try to jump the ship, but his credibility was never in understanding concerns of “the little people”, such as carburant prices, so I’d say Russians will try to recruit elsewhere next. It’d be nice to see what’s in store for Jacob and Annunziata, although I think Marjorie mentioned Jacob somewhere not too long ago. According to the Guardian the Brexit Party was first registered with the Electoral Commission on 11 January 2019 so presumably the founding date given by Wikipedia is wrong. If the Registration date is used the Sun is exactly Conjunct Pluto at 20° Capricorn. It is in a opposition to the Neptune/Mars Conjunction in the Conservative Party 1912 Chart and the Moon/Mars in the Conservative Party 1834 Tamworth Manifesto Chart. Hi Marjorie, Does the launch date of the Brexit Party today not have an astrological impact? Nigel was on GMB Good Morn Briton at about 6.43am speaking about his launch. Are transits favourable from today? If you do, With thanks in advance your time and thought.